(February 8, 2009) The World Food Summit (WFS) was held in November 1996. The WFS, as spelled out in its final document, clearly indicated what was needed and expected to be done. The WFS overall objective was “… to eradicate hunger in all countries, with an immediate view to reducing the number of undernourished people to half their present  level no later than 2015”. 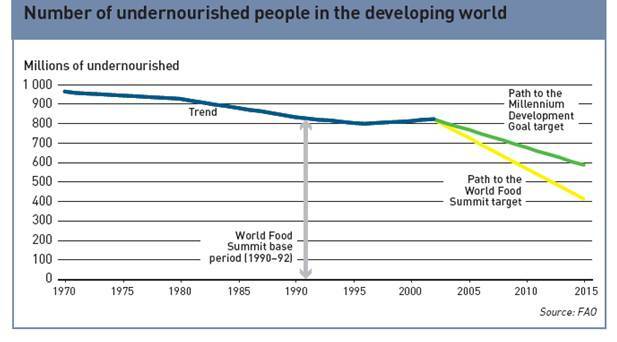 This represented a target goal of 412 million people undernourished, down from 824 million (estimated) in 1996. The WFS participating countries did make wise decisions and the outcome documents were ambitious and well formulated, particularly so because they indicated a commitment on behalf of the international community to address the issue of hunger. The large number of countries that participated in the Summit gave reasons for optimism. The goals were formulated as 7 commitments, with subsequent objectives and actions. This was a signal that it was seriously meant. The 7th commitment’s title was “We will implement, monitor, and follow-up this Plan of Action at all levels in cooperation with the international community”. During the negotiations it turned out that the majority of the delegates did not know that adequate food is a human right. At the same time they rejected the idea of a code of conduct (which was suggested by many of the present countries and NGOs). In the commitment 7, the objective 7.4 reads “To clarify the content of the right to adequate food and the fundamental right of everyone to be free from hunger, as stated in the International Covenant on Economic, Social and Cultural Rights and other relevant international and regional instruments, and to give particular attention to implementation and full and progressive realization of this right as a means of achieving food security for all.” Before and during the negotiations few thought that this was possible to achieve. This result one can safely say was a major milestone since it put the right to adequate food firmly on the international agenda. It led to the General Comment 12 on the right to adequate food some years later, which defines the meaning of the human right to adequate food. Thus, though the goals did not specifically define the right to adequate food, the adoption of all the commitments and objectives, specifically objective 7.4, this worldwide conference with the overall goal to reduce the worst hunger did reflect its importance, and mentioning human rights is above what anybody could expect. The Millennium Summit, held in New York in September 2000 adopted a Millennium Declaration which brought together various international development goals developed during the 1990s into an overall development agenda. The first Millennium Development Goal, based on the WFS goal, is to halve, between 1990 and 2015, the proportion of people who suffer from hunger. This is less stringent than the WFS goal, as reaching the WFS goal required a reduction to half in the actual number—not just the proportion—of starving people. Continued population growth means that the proportion of hungry people in the developing countries will need to be cut by much more than half if the WFS target is to be met. If the MDG target is achieved in 2015 by the developing countries as a group, current population projections suggest that the world will still be left with around 585 million undernourished, far more (173 million) than the WFS target of 412 million. During the five years after the WFS, FAO and the rest of the world were worried about the slow pace of improvement throughout the world, particularly in the developing part of the world. Though China and perhaps even India were on track to meet their commitments, it was obvious that countries in sub-Saharan Africa would not be able to meet the WFS goal. reversing the overall decline of agriculture and rural development in the national budgets of developing countries, in assistance provided by developed countries, and in lending by the international financing institutions. Again the countries participating in WFS:fyl committed themselves to reduce hunger and to go on further do make a tool for member countries in how to use a human rights approaches in food policies. FAO maintains that it has developed a measure useful to assess the level of undernourishment. It is based on the estimation of the distribution of the dietary energy supply within a country’s population. This measure is used to estimate the number and proportion of undernourished annually, and the results are reported as a three-year moving average to the Committee on World Food Security (CFS) and in the FAO publication the State of Food Insecurity in the World (SOFI). The FAO measure of undernourishment has been used to monitor progress toward the World Food Summit goal. Many have criticized the use of this indicator based on estimates of the number of undernourished versus the use of anthropometry, especially since they are measuring two different aspects of the same problem of poor nutritional status. However, although the FAO maintain to recognize its limitations, it argues that it has a big advantage in that it is calculated each year in a consistent way for all countries. As it turned out the Inter-Agency Working Group (IAWG) on FIVIMS1 (involving more than 25 international, bilateral, and non-governmental organizations) in its work has defined undernourishment as “food intake that is insufficient to meet dietary energy requirements continuously”, with the measure adopted being that of FAO. However, even though the UN and many with it has agreed to use FAOs measure on undernourished, it does not mean that it is good enough. The SOFI was supposed to report on the achievement towards the WFS objective which the world leaders committed themselves to, and which was considered an attainable intermediate goal, namely to halve by 2015 the number of undernourished people in the world from the 1990 level. The 2006 SOFI said that ten years after WFS the sad reality was that very little progress had been made towards that objective. In 2006, compared with 1990/92, the number of undernourished people in the developing countries had declined by a meagre 3 million, a number within the bounds of statistical error. Apparently neither the national governments who have the main responsibility for its population, nor the international community2 have fulfilled their commitments given during the World Food Summit in 1996. Not all news was dismal though. Despite disappointing performances in reducing the number of hungry people, a smaller percentage of the populations of developing countries were undernourished that year compared with 1990/92: 17 percent against 20 percent. The figure below from SOFI 2006 shows (blue line) that the number of hungry people have not been reduced since the WFS and that there will have to be dramatic reductions between now and 2015 if hunger reduction targets are to be met. The sharply increasing price of food got the world’s attention in 2008. The poor could not compensate for the unprecedented price increase on food since they had already been spending most of their income on food before the price increase. The reaction of people in the world came quite quickly – food riots threatening stability of countries started to appear. In 2008 CBC News reported on rice riots and empty silos and did ask whether the world was running out of food. BBC reported on food riots that turned deadly in Haiti. On Times Online one could read about food riots, hoarding, panic, and the news channel asked whether this was the sign of things to come. One could also read about Mexico’s tortilla riots, and CNN reported on riots, instability spread as food prices skyrocketed. One publisher raised the issue quite dramatically by stating “Democracy Now Stuffed and Starved: As Food Riots Break out Across the Globe”. Therefore another world summit, now called a high level conference on food security, was held in Rome in 2008. Part of the background was that on 28 April, 2008, the United Nations Secretary-General established a Task Force on the Global Food Security Crisis under his chairmanship and composed of the heads of the United Nations specialized agencies, funds and programs, Bretton Woods institutions and relevant parts of the UN Secretariat. The primary aim of the Task Force was to promote a unified response to the global food price challenge, including by facilitating the creation of a prioritized plan of action and coordinating its implementation. That was seen as essential since the WFS, WFS:ful and the MDG did not generate the wanted results. The food price crisis resulted in more poor people in the world, not less. Two key elements leading to the sharp rise in prices were said to be greater demand for food, and diversion of food production for use as bio-fuels. FAO stated recently that eating habits in developing countries have changed dramatically in the last 20 years in particular leading to an increased demand for meat and grain used to produce meat (e.g. in China where people were eating 20 kg of meat annually in 1980, while in 2007 they were eating 50 kg annually). Such dramatic changes have of course an impact, but this change has happened over a 20 year time span. In the 2007 report to the Committee on Food Security (CFS) of FAO pointed to the rapidly increasing prices of grain. It turned out later that many more commodities were affected by considerable price increases. The world had simply created a situation of systematic and long term vulnerability, which was not obvious as long as the market did not have a dramatic influence on prices to the consumer, but as soon as the price increases happened, it came as a surprise to many. Bio-fuels also played an important role in the food price increase. When CFS had its meeting in May 2007 this issue created concern. FAO had the year before been asked to prepare a document on the link between bio-fuel and food security, but did not show any enthusiasm for the issue. A report was however prepared and presented. The issue was clearly not taken seriously enough, and the CFS secretariat was asked to follow up the issue with a new and more thorough report on the next CFS meeting. Some delegations stressed that even if the bio-fuel production was excluded one should expect tighter global grain markets, because of the use of more grains as feed in meat production, and an expected increasing in the global population. This issue was more or less submerged with other issues gaining more attention. The international community did not see it possible within a short period of time to mitigate the shock created by the increase in prices. It was clear though that the higher food prices have set back progress towards reduction of poverty and hunger (MDG1). Characteristics of the countries most vulnerable to hunger include: high initial poverty rates and food expenditure shares of household income; large net food and fuel imports; stagnant or slow agricultural productivity growth; large urban populations; and high incidence of malnourishment, especially for women and children. The World Food Summit created hope that the international community was taking hunger problems seriously. However, after relatively few years the statistics did not show much of an improvement, although in some parts of the world there were signs of hopeful change. Because of a worrying lack of progress the World Food Summit: five years later was held in Rome, reiterating the Commitments of the 1996 Summit, and giving signals on developing further the right to adequate food. The Millennium Summit renewed the commitment that hunger would be addressed, although with a reduced goal. Unfortunately it became clear early that what the millennium summit contributed was to make visible the lack of progress of reducing the number of hungry in the world. The last world summit (2008), convened as a reaction to the increase in food prices, was held at a critical time. However, the recognition that the world had simply created a situation of systematic and long term vulnerability through its actions was not recognised by this summit. The outcome of this summit was weak and reflected the unwillingness of the international community to commit resources through the UN. Attempts to get the bio-fuel issue on the agenda failed, even though increasing bio-fuel production will lead to higher future food prices, despite that many countries pushed to get bio-fuels considered. There was not even an information document on the bio-fuels issue issued by the summit. The financial crisis has made the situation even worse. In summary it can be said that national governments and the international community have failed again, leaving the majority of the poor to their misery for many years to come. Oshaug is Professor of Public Nutrition at the Akershus University College, Kjeller, Norway. He was a member of the official Norwegian delegation to the World Food Summit in 1996 and 2002 and to the meetings in 2003 and 2004 of the IGWG to elaborate the voluntary guidelines of the right to food. 1 Food Insecurity and Vulnerability Information and Mapping System. 2 The bilateral donors have agreed to finance aid to poorer countries to a level of 0.7 % of their gross domestic product.